JANELLE PATTERSON The Marietta Times A single line of traffic flows with solar-powered traffic signals above and below a slip on Ohio 145 north of Lower Salem and south of Wetzler Road Monday. It’s been six months since roads across the county, and much of Southeastern Ohio began slipping away. The landslips were caused by extended periods of rain over-saturating the soil and roads along hillsides unable to take the strain of traffic and water. Ohio Department of Transportation District 10 began work on two slips on Ohio145 Monday, with one reopening traffic along both lanes while the other remains single-lane traffic for upcoming months. The slip below Wetzler Road has solar-powered traffic signals warding drivers off of the area where the road is falling down the hill into a creek, but Bonar said the route only gets congested in the early morning hours as those from Noble and Monroe counties and Salem Township make their way south for work or in the evenings when they head home. The two slips on Ohio 145 are among the 18 ODOT is addressing through federal highway fund dollars this year, bypassing the longer process the county, cities and townships face applying to the Federal Emergency Management Agency for 100 percent funding to repair disintegrating roads and hillsides. 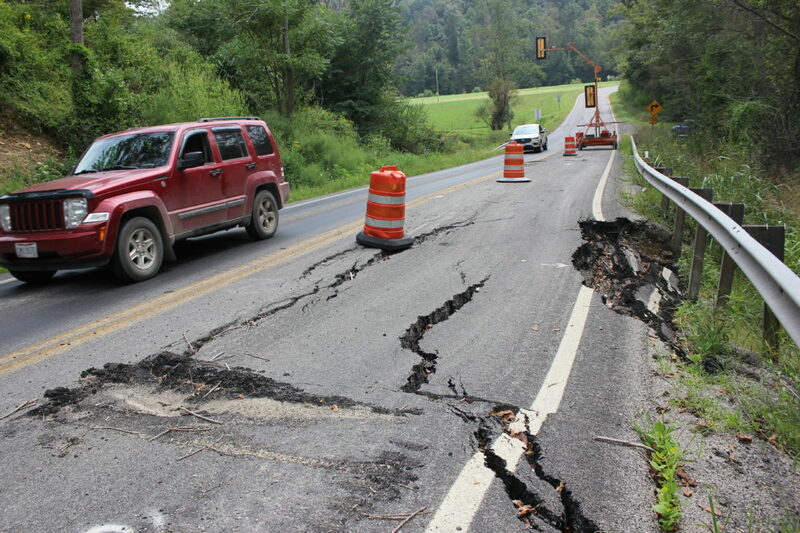 ODOT Public Information Officer Ashley Rittenhouse said Monday these landslides are the result of heavy rains that fell in the spring and this summer. Patrick Lang, assistant vice president of The Peoples Savings Bank in Lower Salem said he hasn’t heard many complaints from customers about the slip on Ohio 145, but he is worried with schools starting soon that buses will add strain to roads throughout the county and townships. County Engineer Roger Wright said his department has worked all summer to answer FEMA’s requirements for county road funding and he is now compiling similar technical reports, histories of repairs, histories of county factors like soil and rainfall for each township road affected by the spring and summer downpours. Rittenhouse explained that when a landslide occurs, soil borings are then taken to determine how deep rock is under the road. The Ohio 145 slip will be repaired by the installation of a drilled shaft retaining wall, which according to Bonar, was put in place north of the current slip around 30 years ago. Rittenhouse explained the single lane use will remain through Nov. 1 and that the cost of the project is $365,164.48 to be paid to the contractor, Alan Stone Company Inc.
Total repairs for state routes in District 10 will run approximately $86 million. • There are currently 80 landslides that are part of an emergency event for which the district will receive federal highway funding for repairs. • Repairs are estimated at $86 million.